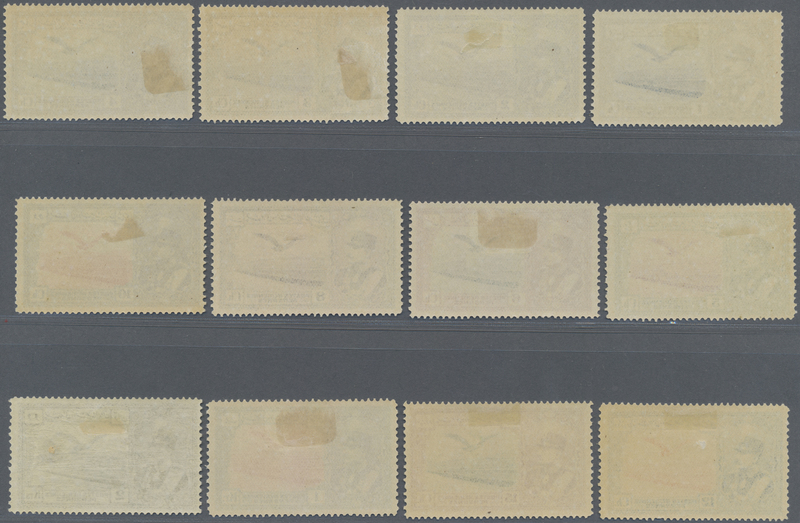 8404 ungebraucht (hinged) * Sc. 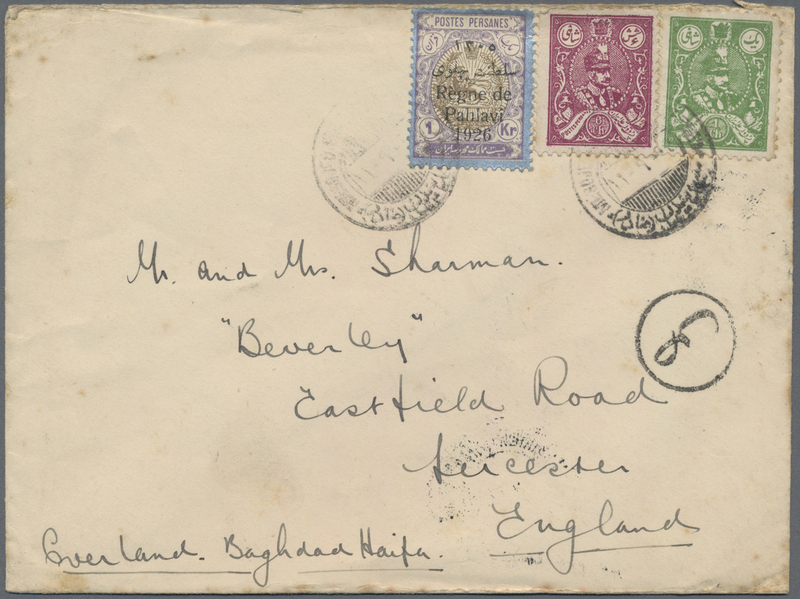 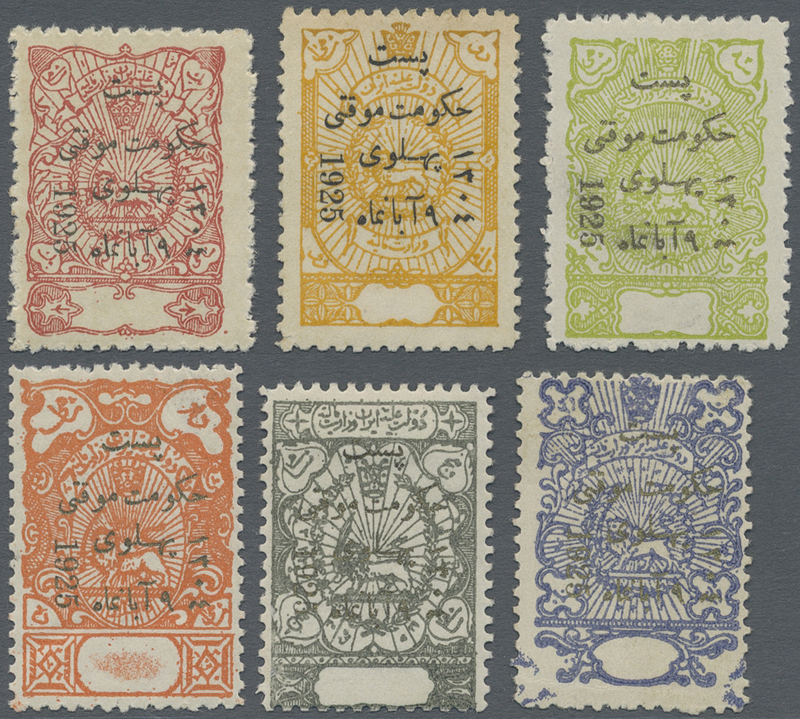 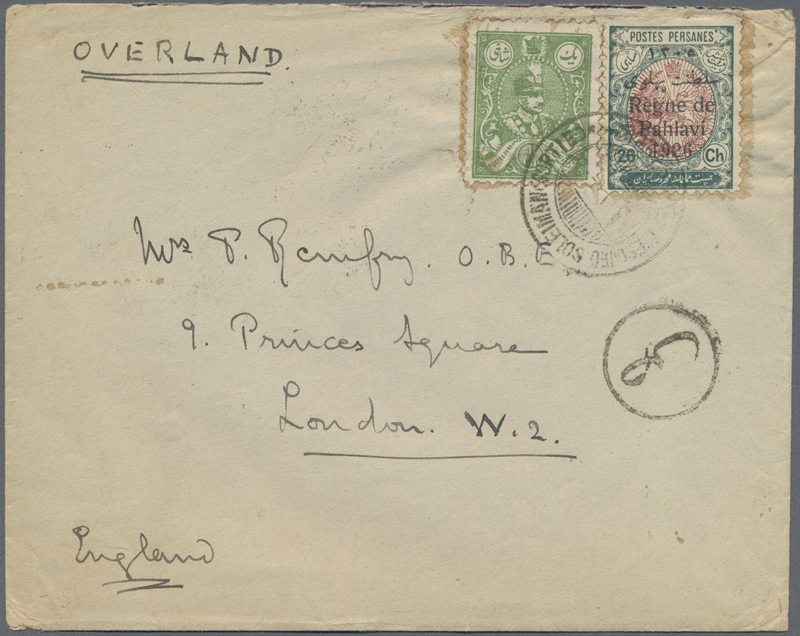 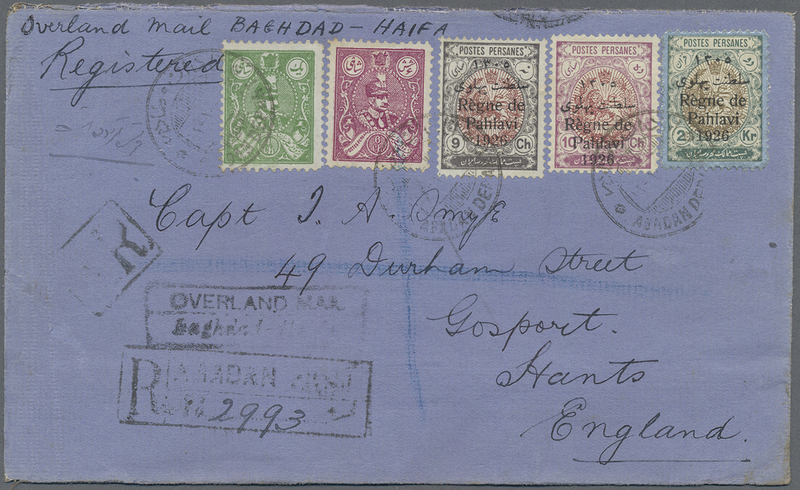 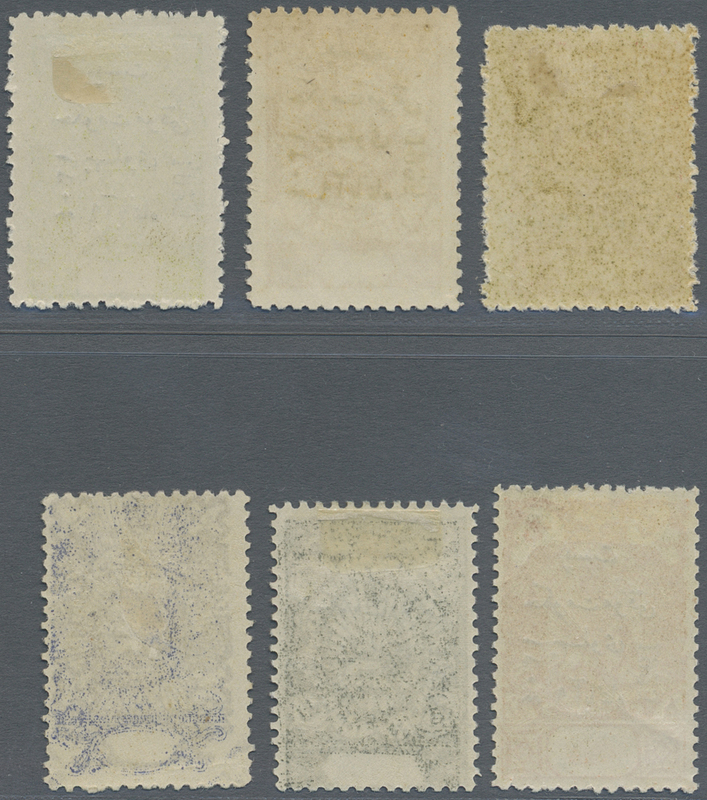 697/702 1925, Overprints on fiscal stamps, complete set of six values, fresh colours and well perforated, mint original gum with hinge remnants. 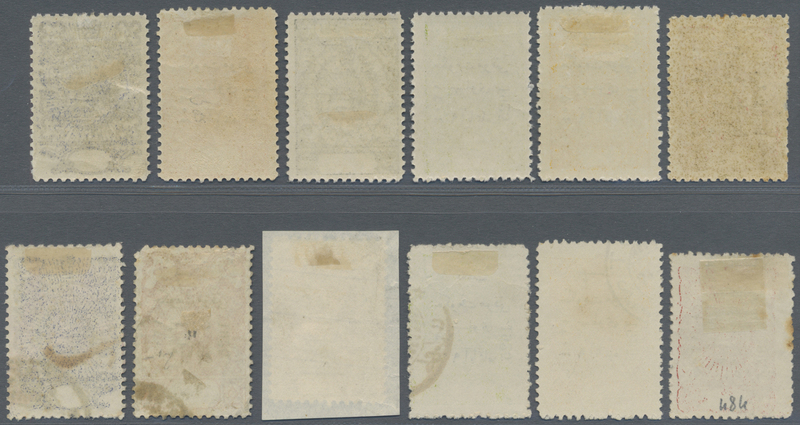 8405 ungebraucht (hinged) * Sc. 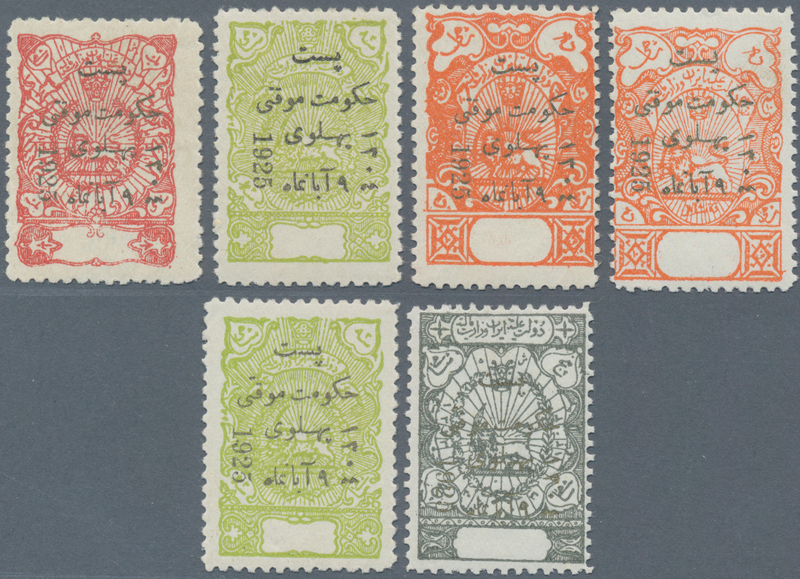 697/702 1925, Overprints on fiscal stamps, complete set of six values, fresh colours and well perforated, mint original gum with hinge remnants. 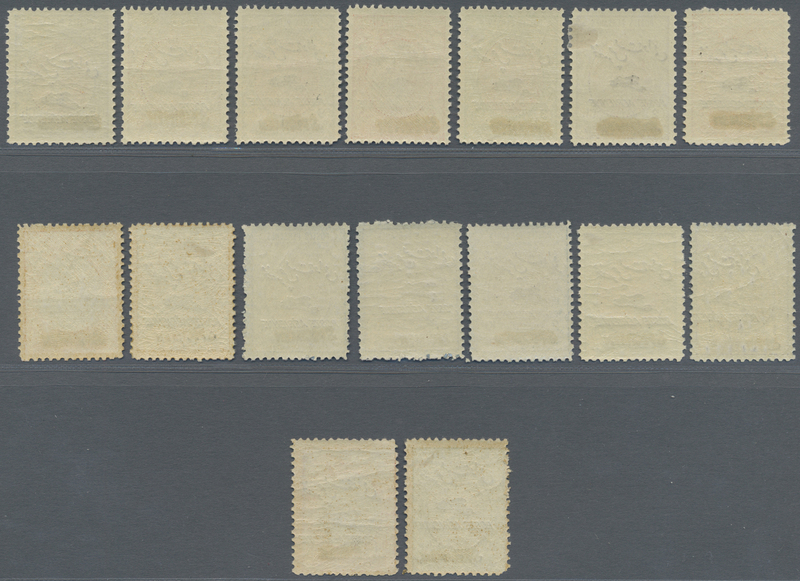 8417 postfrisch (never hinged) ** ungebraucht (hinged) * Sc. 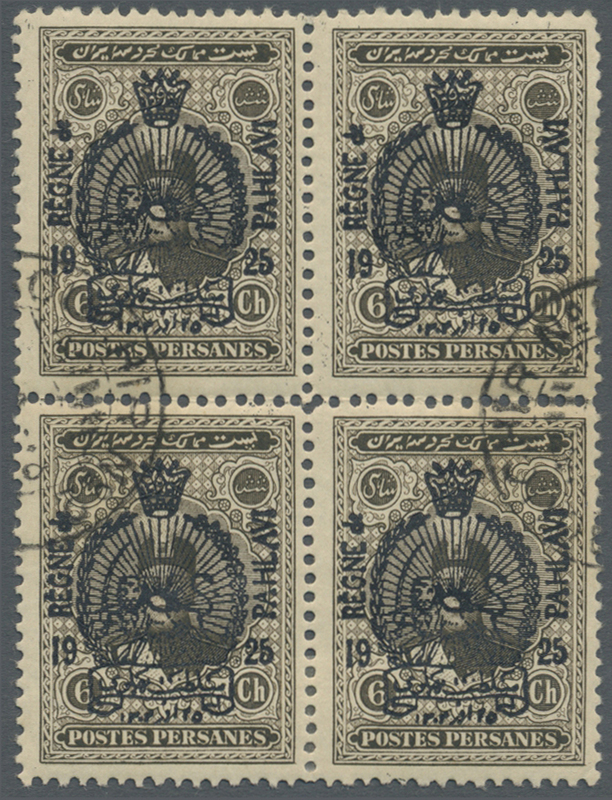 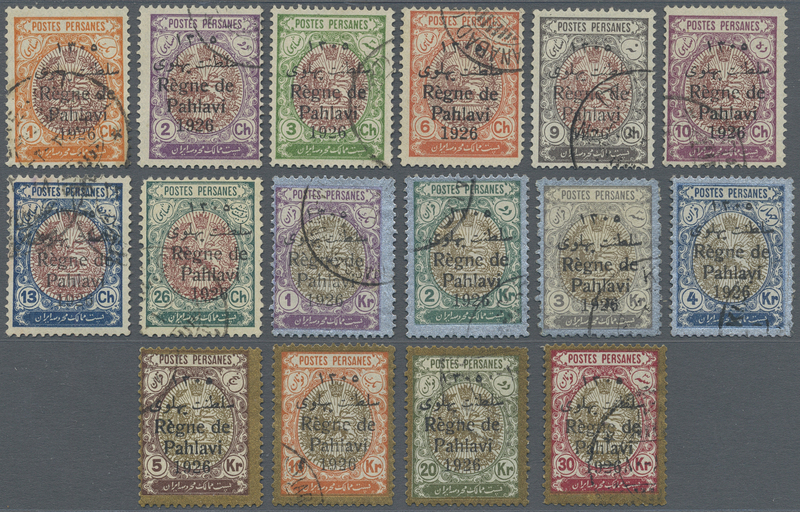 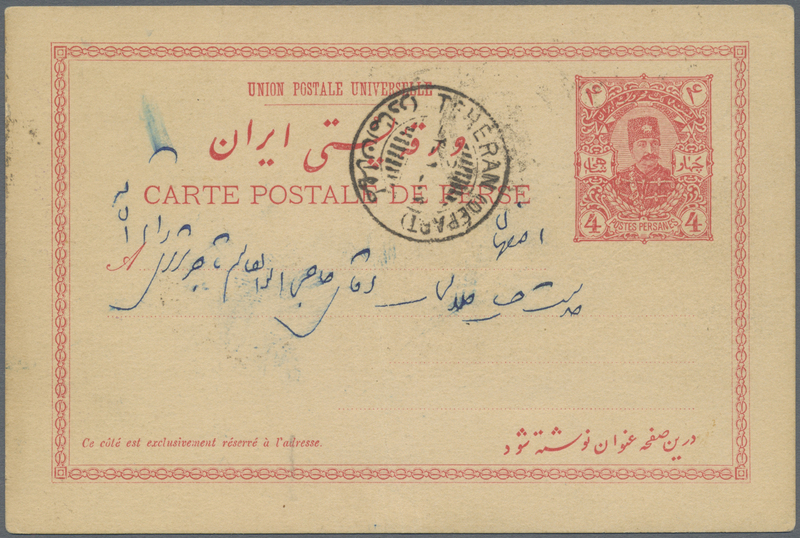 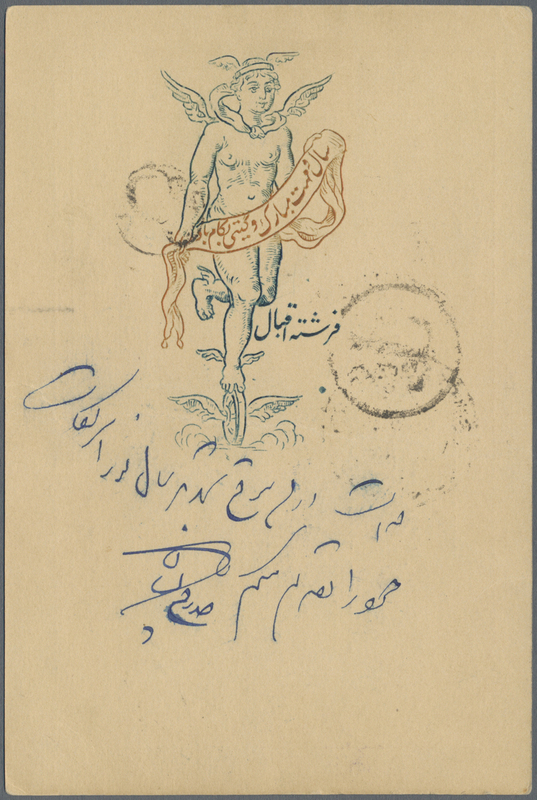 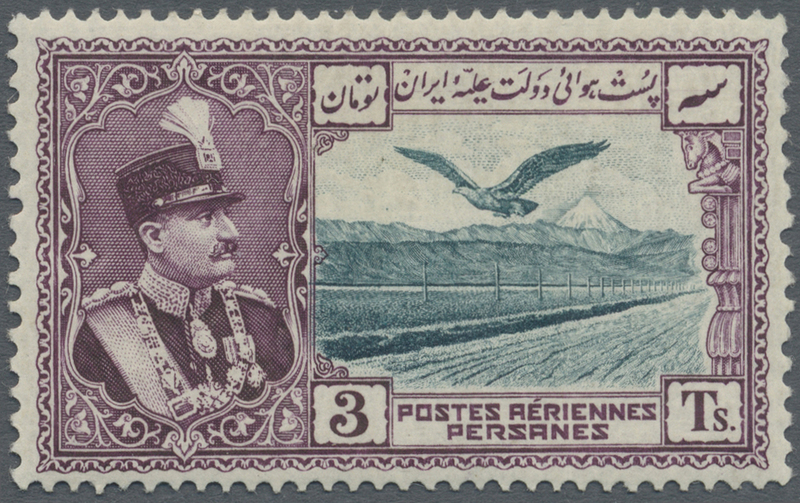 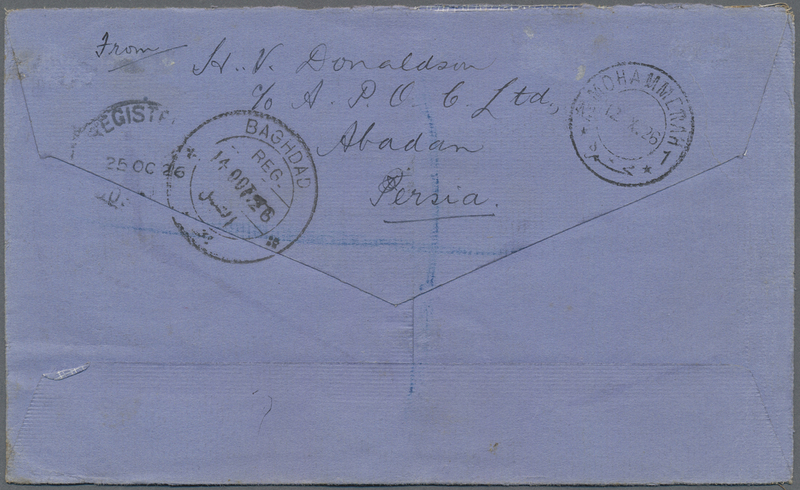 703/06 1926, "REGNE DE PAHLAVI 1925" overprints, complete set, mainly unmounted mint. 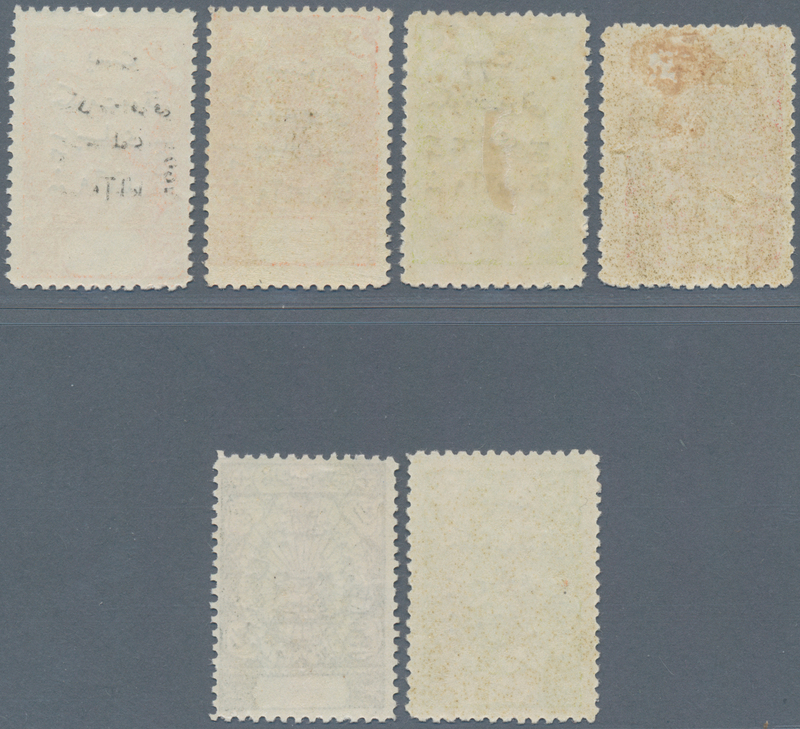 8418 postfrisch (never hinged) ** ungebraucht (hinged) * Sc. 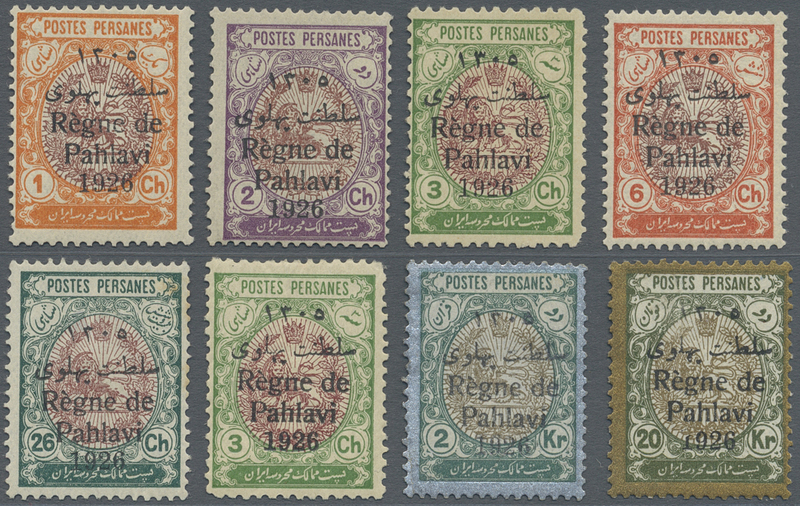 703/06 1926, "REGNE DE PAHLAVI 1925" overprints, complete set, mainly unmounted mint. 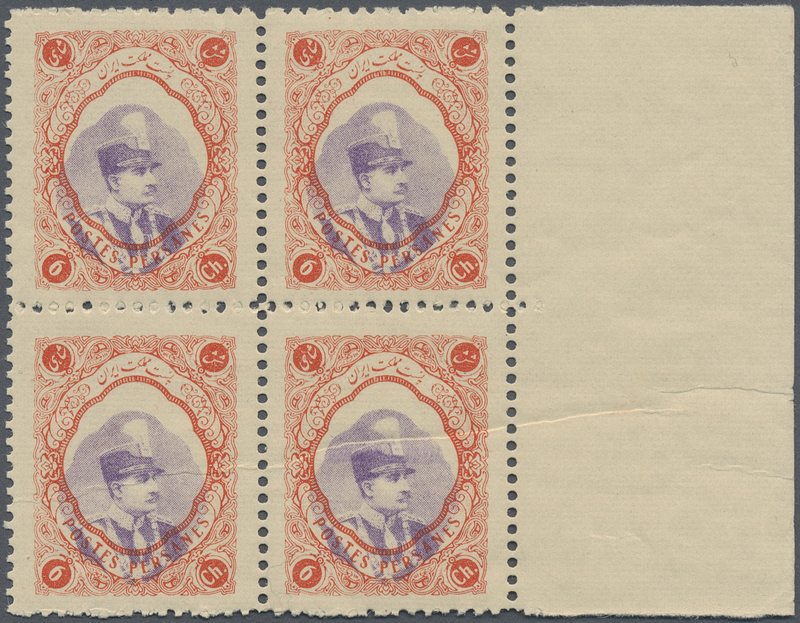 8422 ungebraucht (hinged) * Sc. 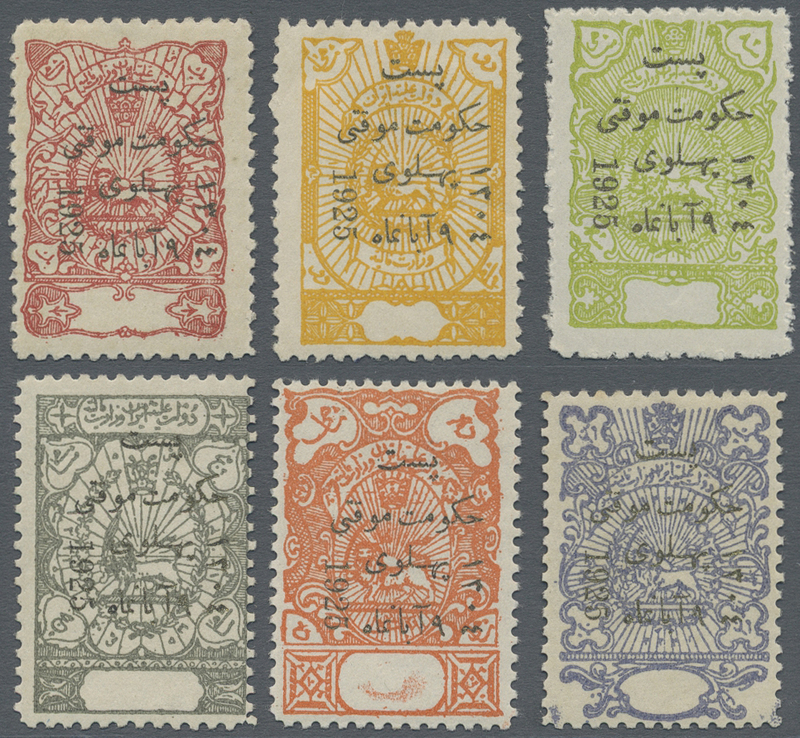 723/34 1926/1929, Definitives Reaz Shah Pahlavi, 1ch.-2kr., complete set of ten values, fresh colours and well perforated, mint original gum, partly some imperfections. 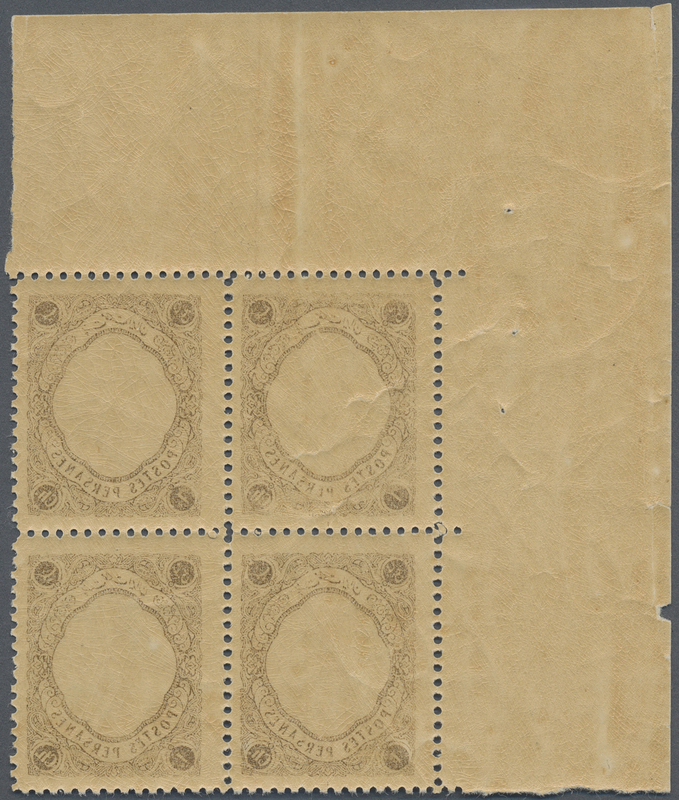 8424 ungebraucht (hinged) * Sc. 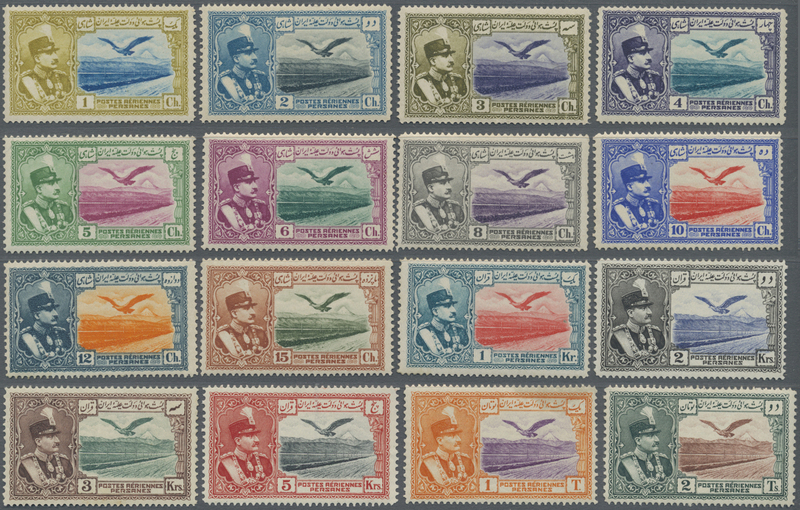 C22/33 1928/1929, Airmails, 1ch.-30kr., complete set of twelve values, fresh colours, mint original gum. 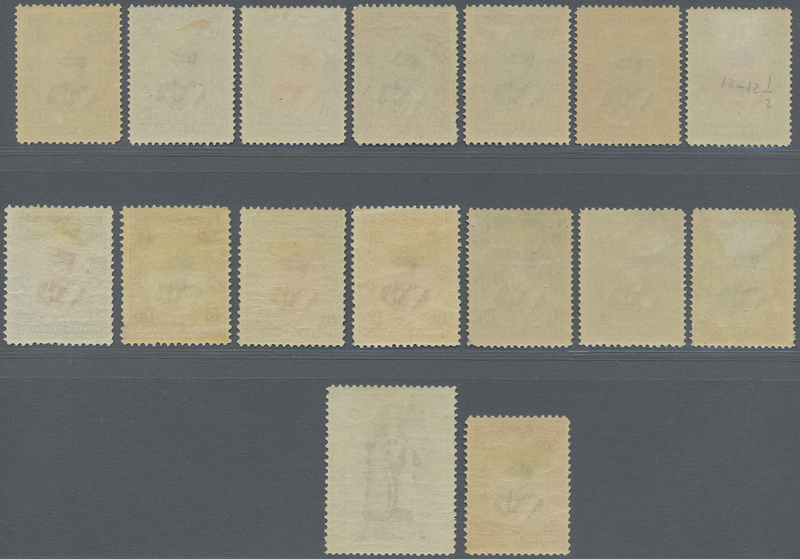 8425 ungebraucht (hinged) * Sc. 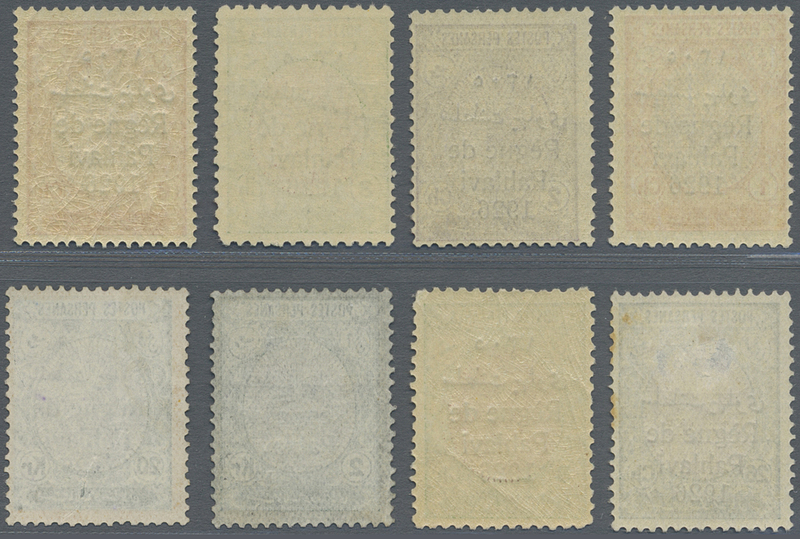 C22/33 1928/1929, Airmails, 1ch.-30kr., complete set of twelve values, fresh colours, mint original gum, partly some imperfections. 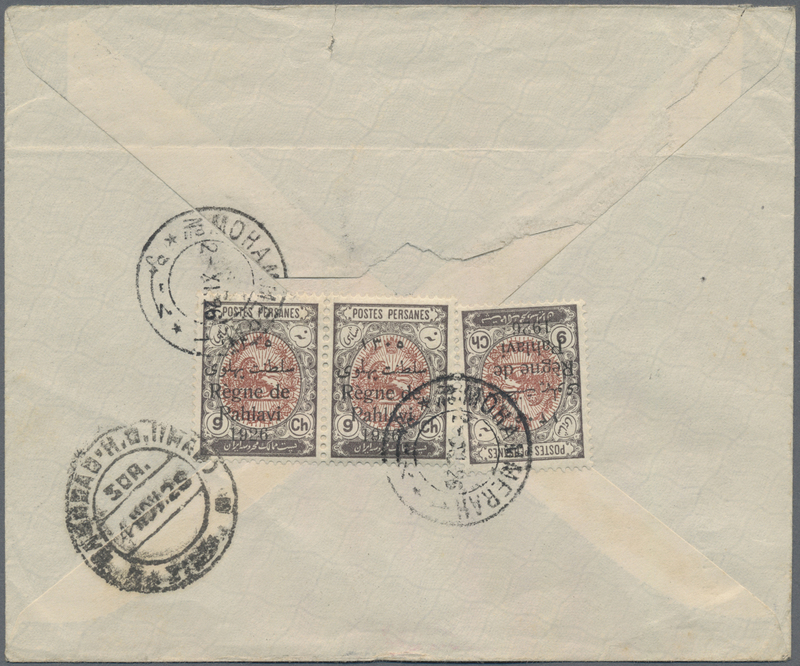 8426 ungebraucht (hinged) * Sc. 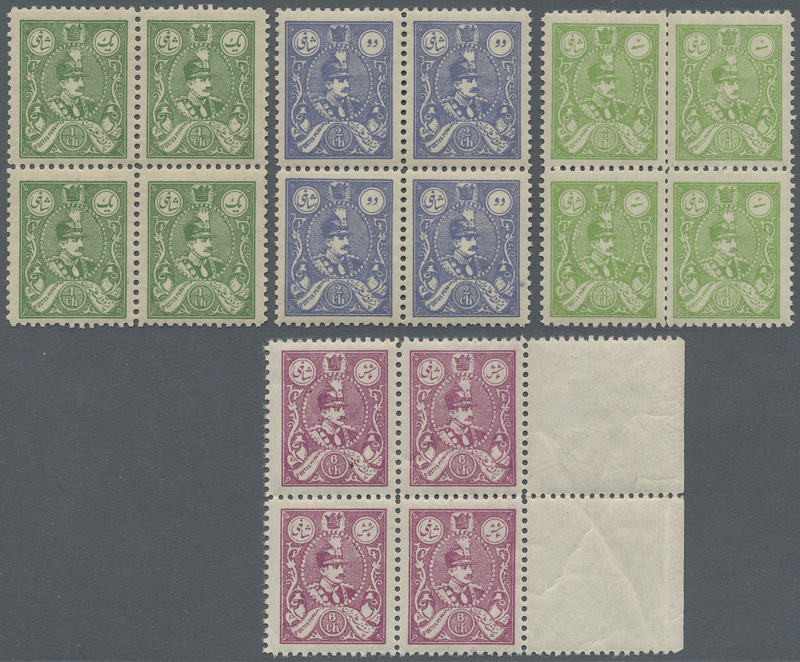 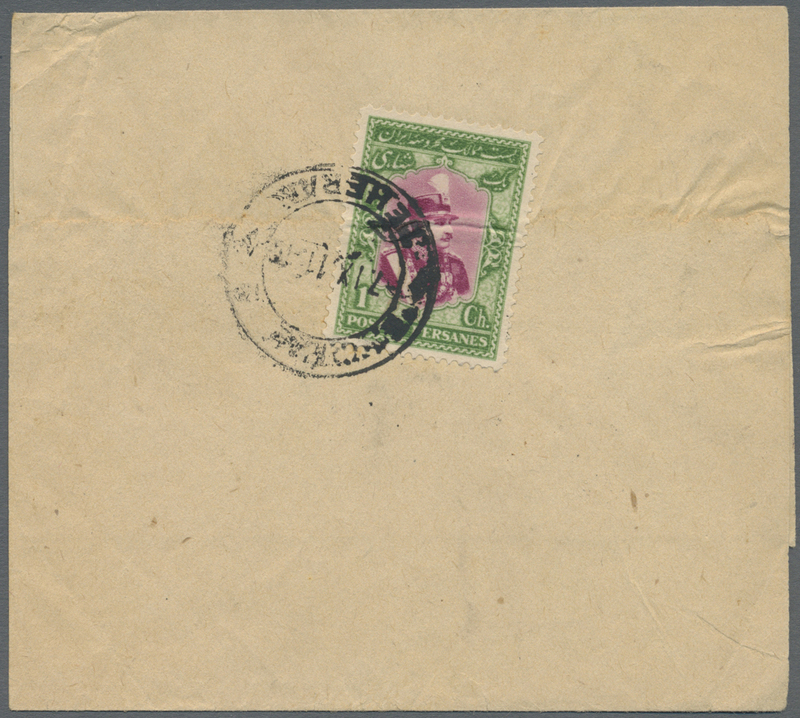 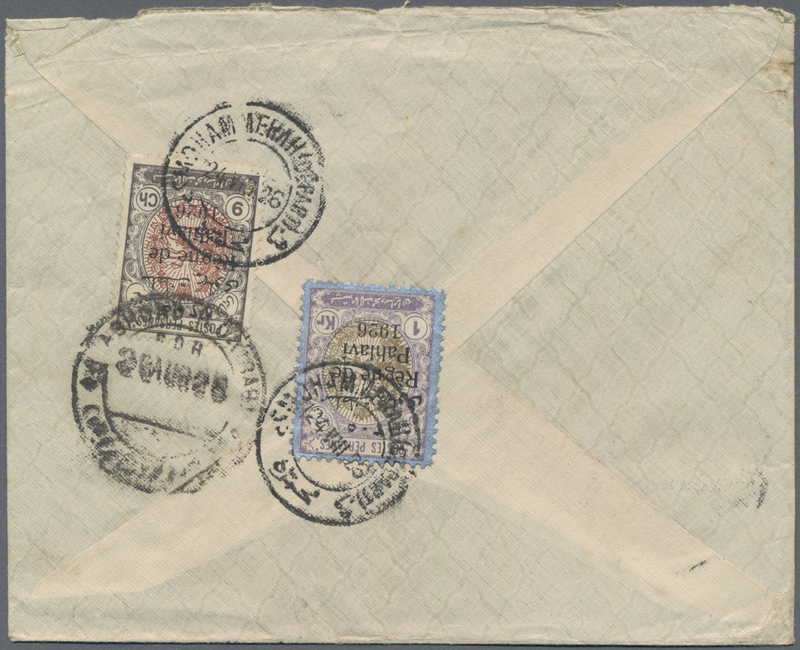 C29/33 1929, Airmails, 3kr.-30kr., complete set of five values, fresh colours, mint original gum with hinge remnants. 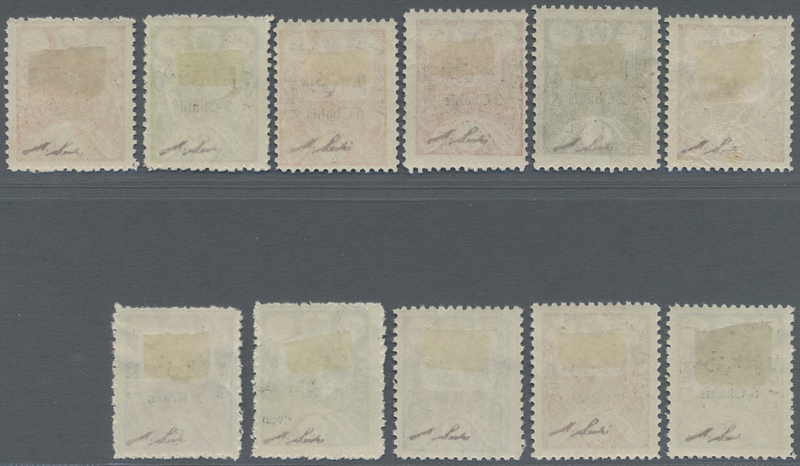 8427 postfrisch (never hinged) ** ungebraucht (hinged) * Sc. 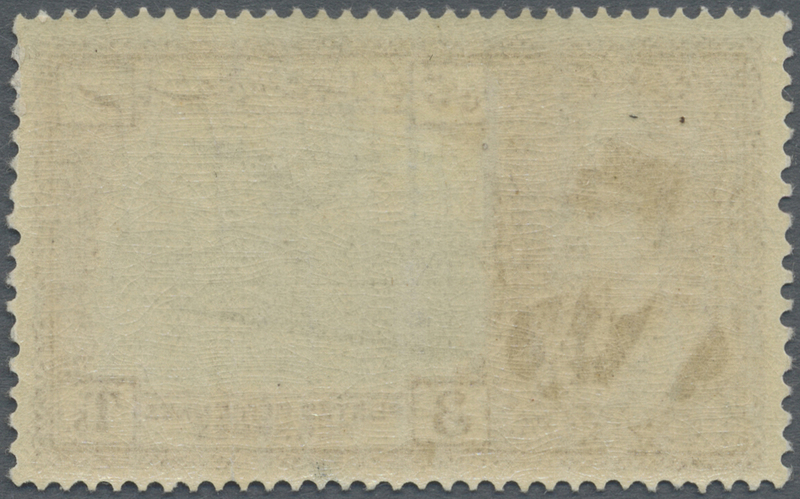 740/43 1928, Redrawn issue, four values complete mint original gum. 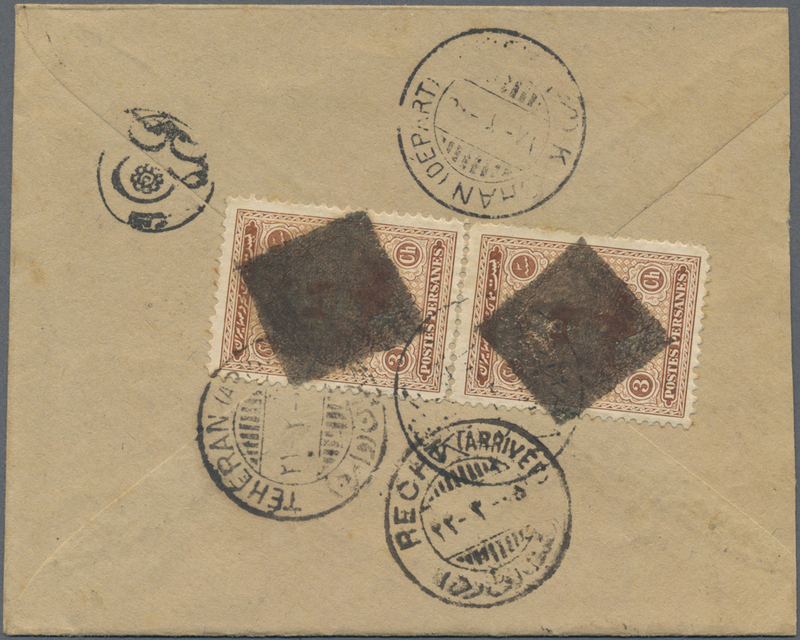 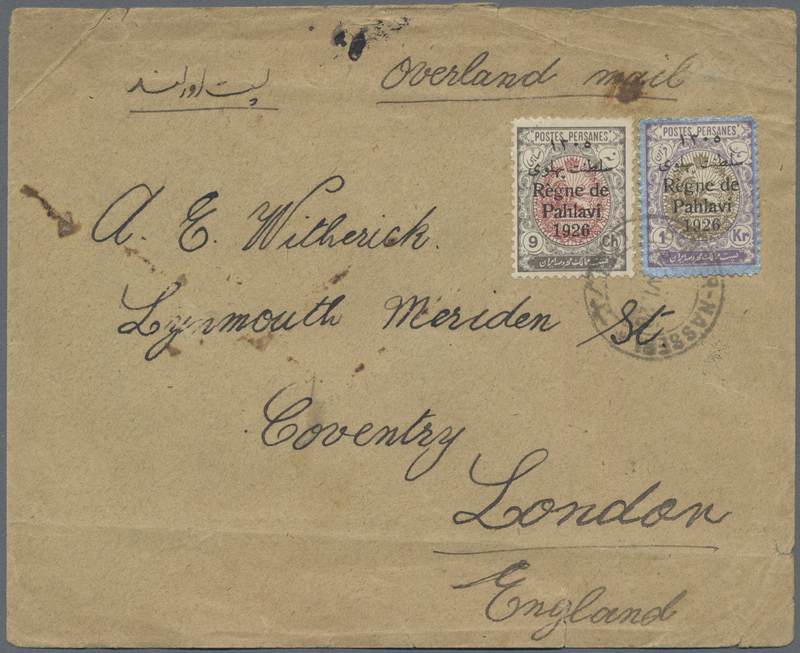 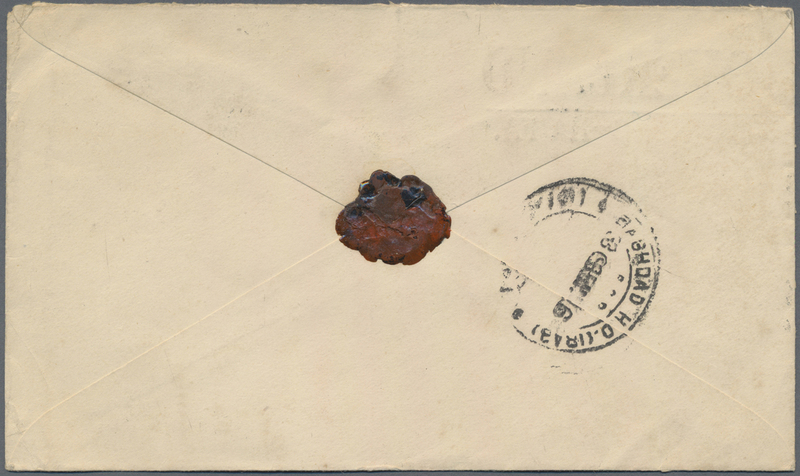 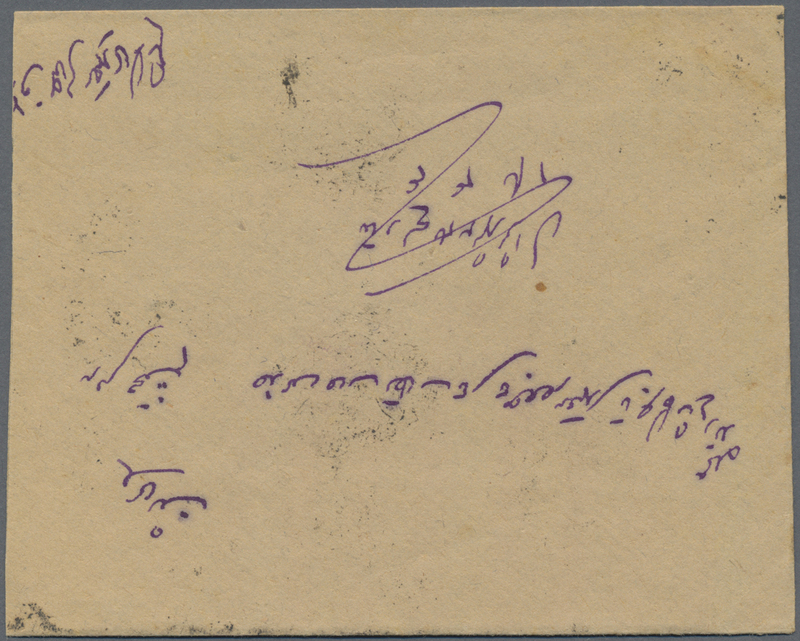 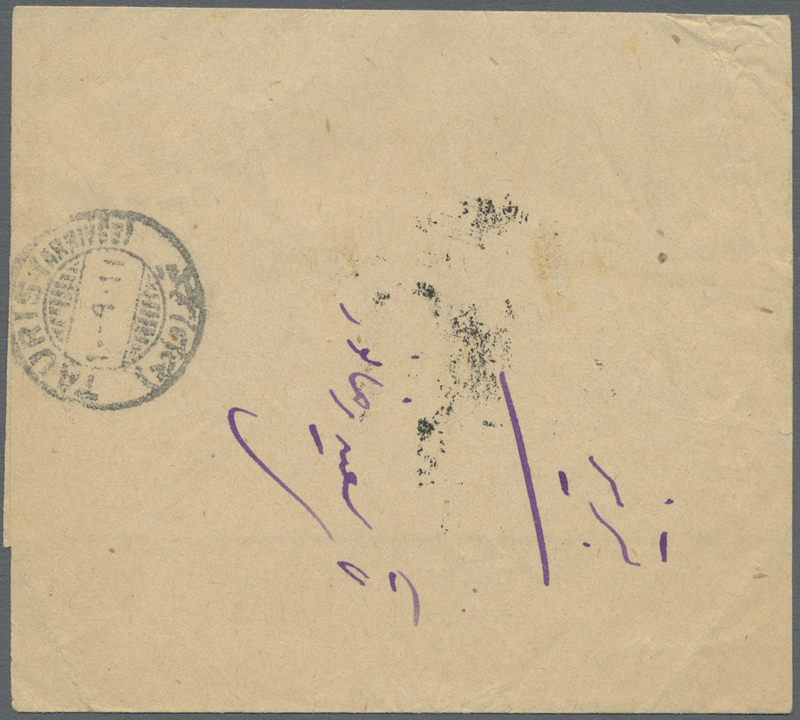 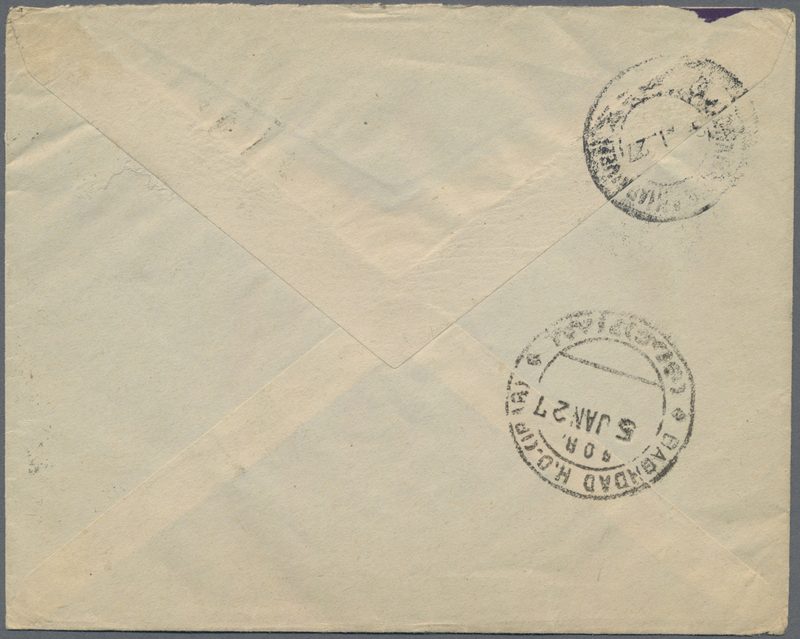 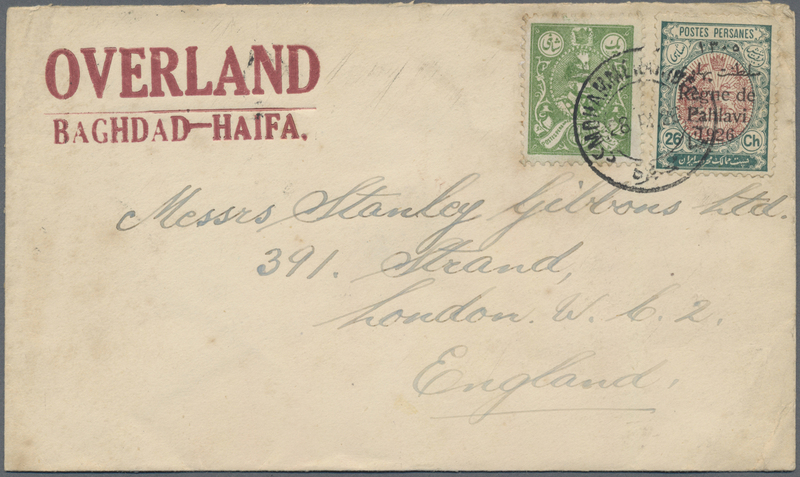 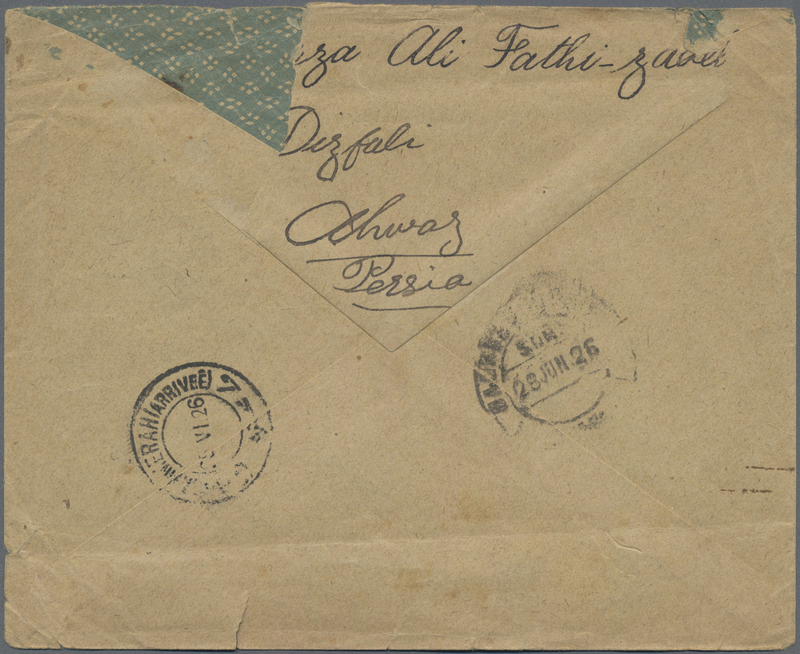 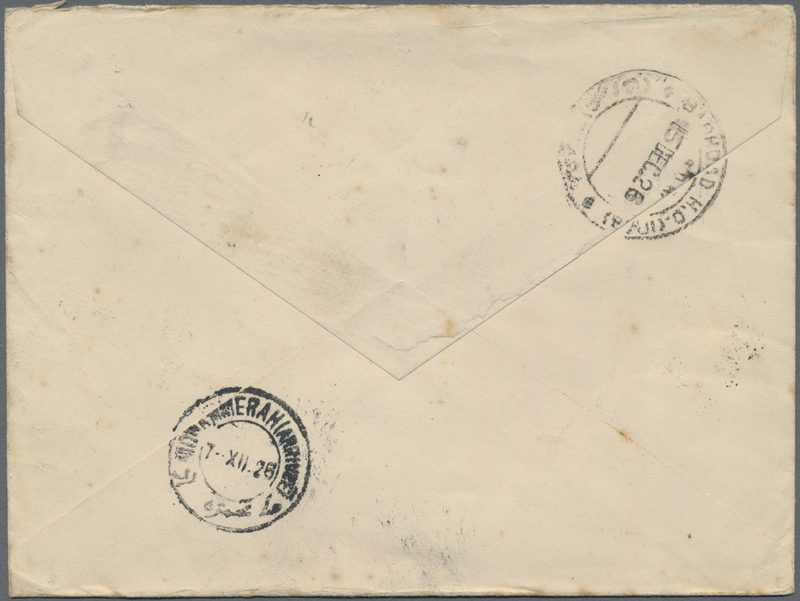 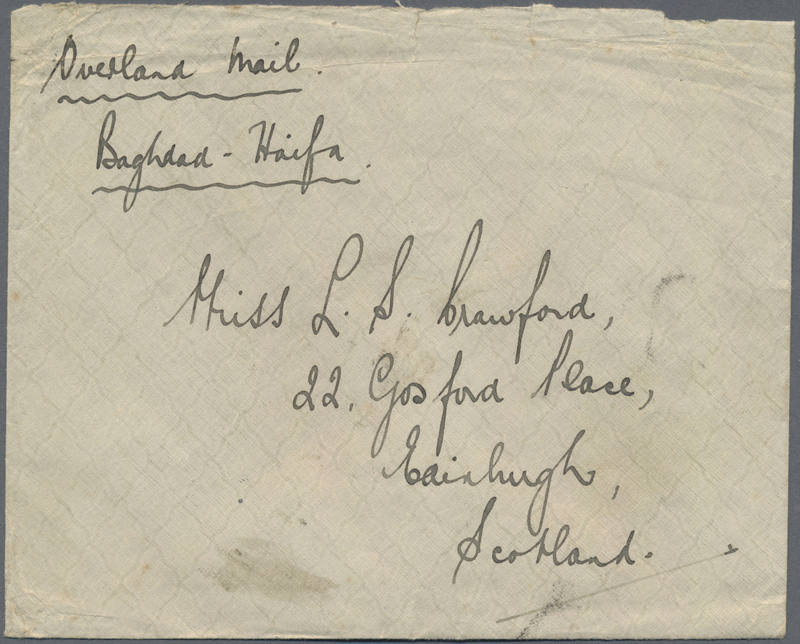 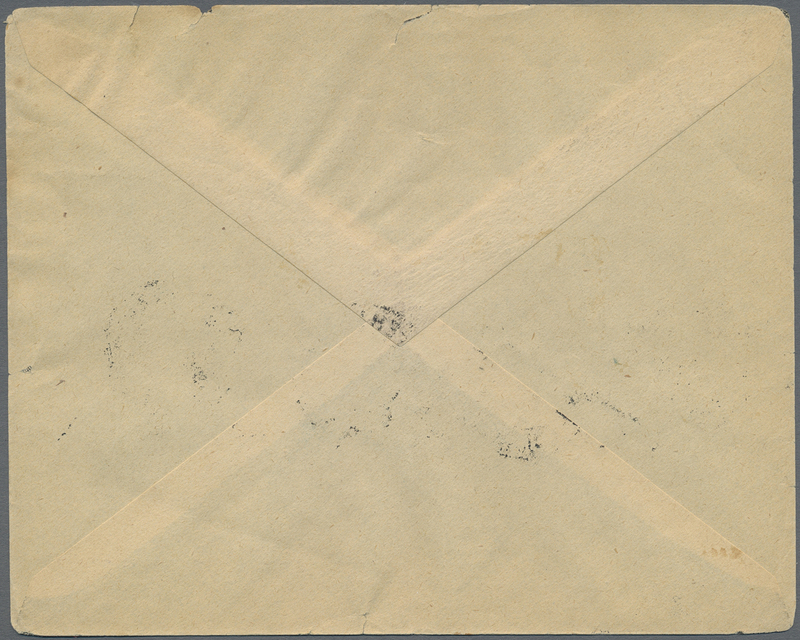 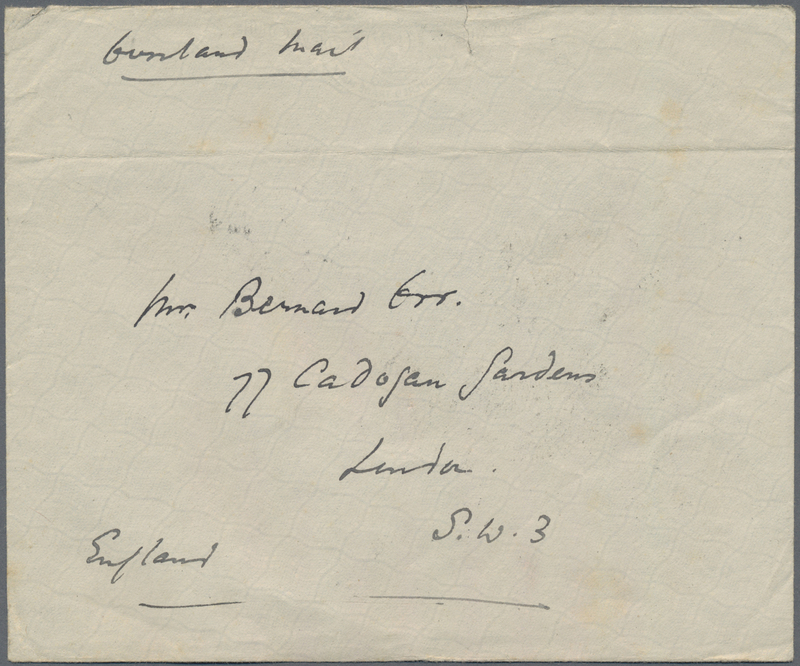 8428 postfrisch (never hinged) ** Sc. 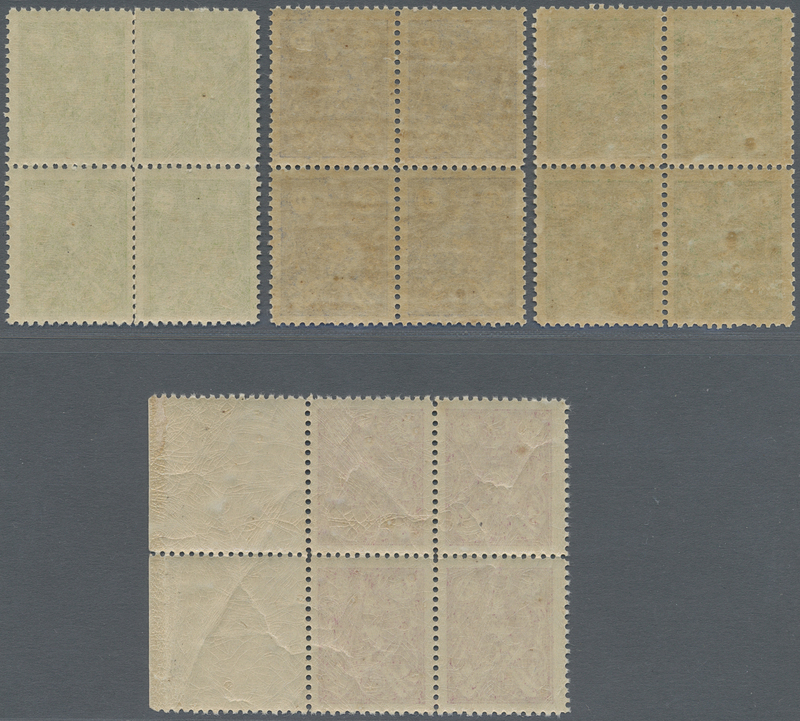 740/43 (4) 1928, Redrawn issue, four values in blocks of four, unmounted mint. 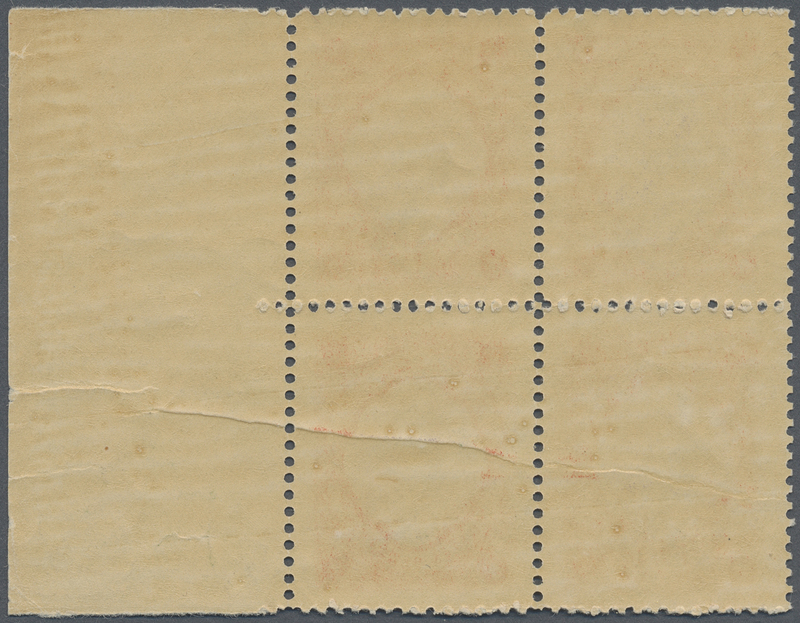 8429 ungebraucht (hinged) * Sc. 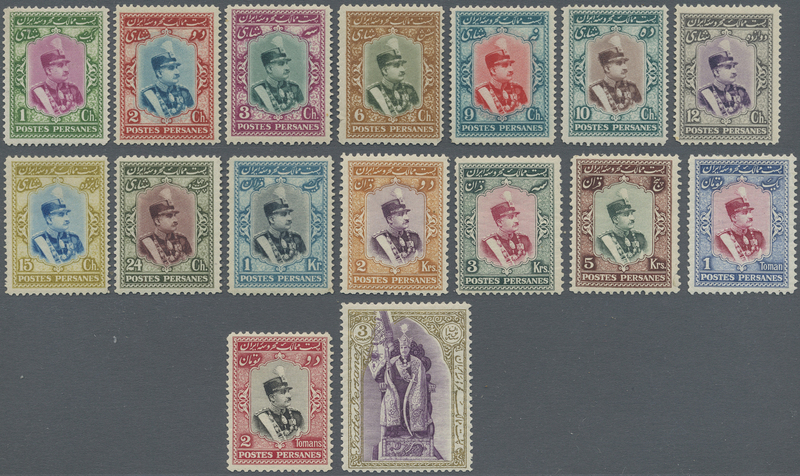 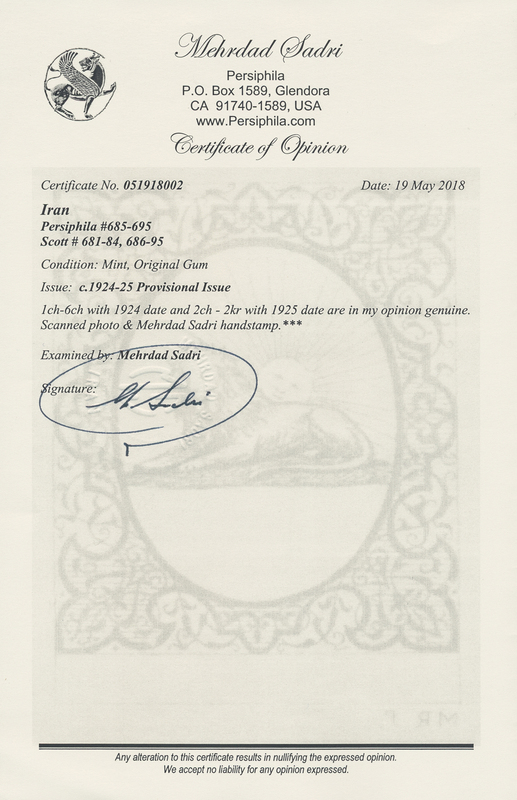 744/59 1929, Definitives Reza Shah Pahlavi, 1ch.-3t., complete set of 16 values, fresh colours and well perforated (6ch. 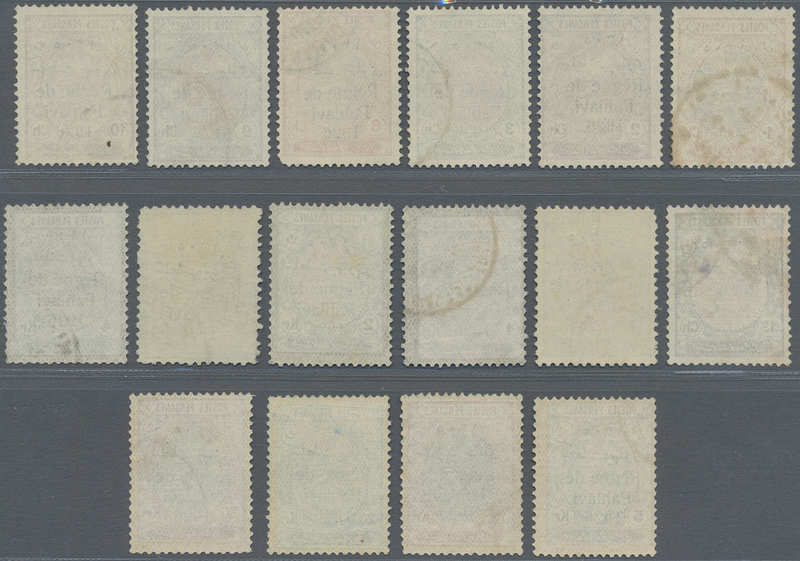 missing perf. 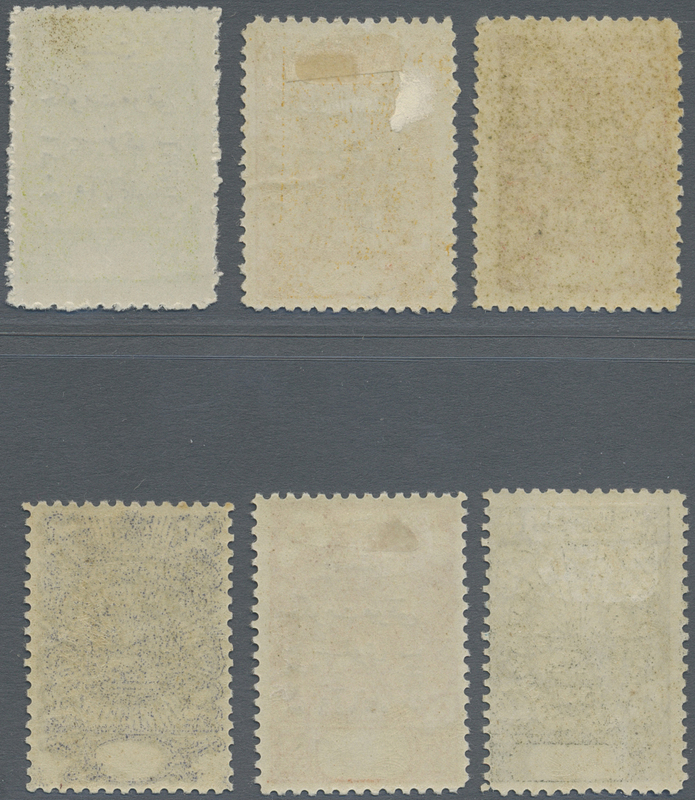 ), mint original gum previoulsy hinged. 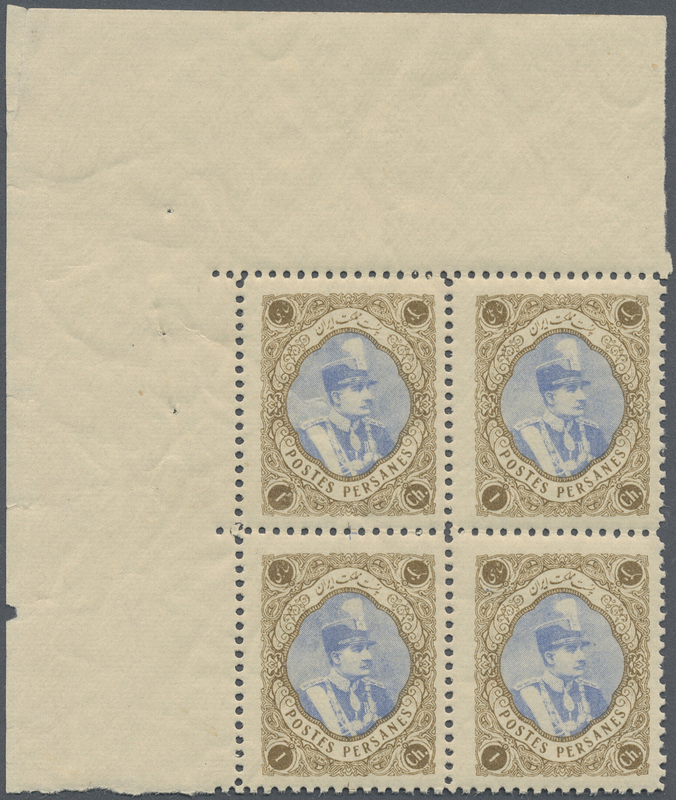 8432 ungebraucht (hinged) * Sc. 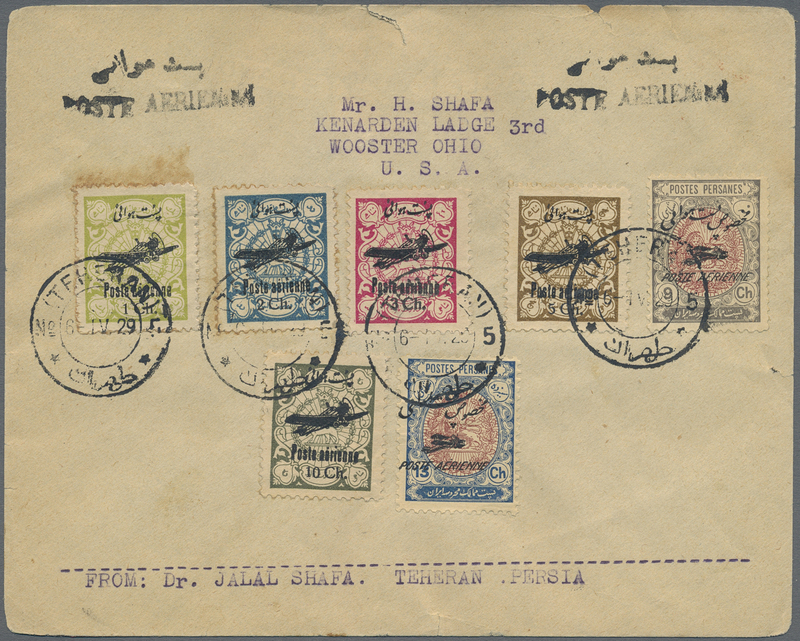 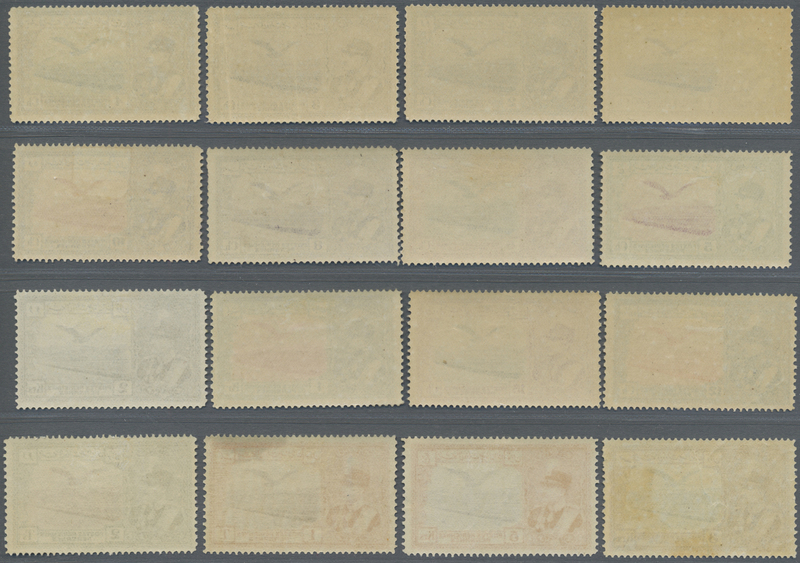 C34/50 1930, Airmails, 1ch.-3t., complete set of 17 values, fresh colours and well perforated, mint original gum with hinge remnant, 5kr. 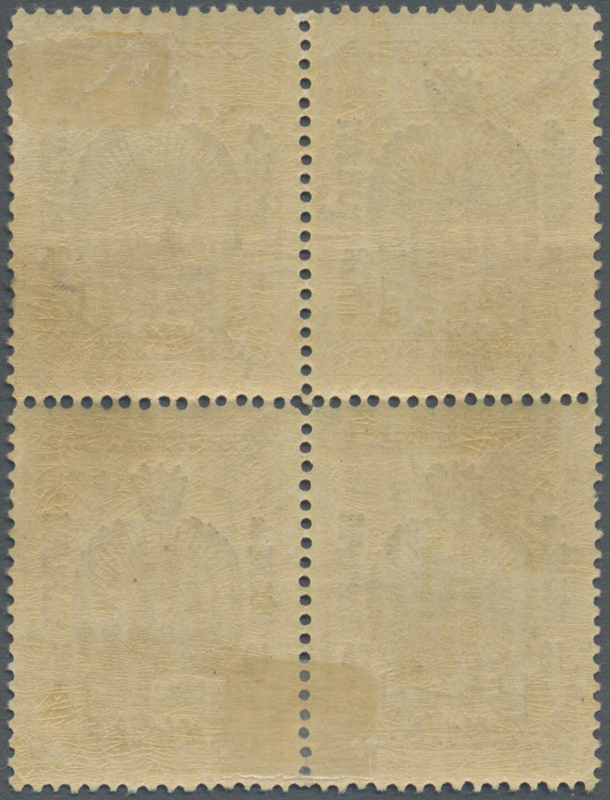 thin spot. 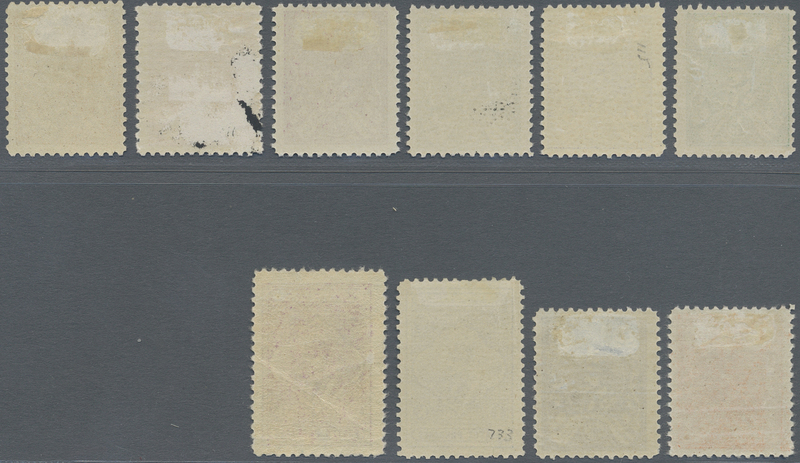 8434 ungebraucht (hinged) * Sc. 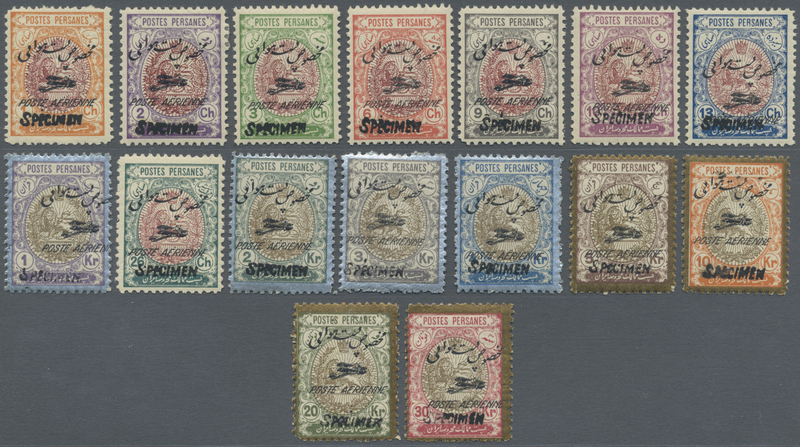 760/70 1931/1932, Definitives Reza Shah Pahlavi, 1ch.-27ch., complete set of eleven values, fresh colours, mint original gum, partly thinned.